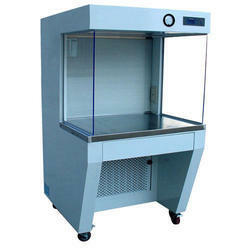 Our range of products include laminar air flow, fume hood, bio safety cabinet and tissue culture rack. Laminar Flow principle involves double filtration of air through coarse pre-filters (upto 5 microns) and Hepafilter (down) to 0.3 microns) for filtration of biological and particulate contaminants. A constant airflow is drawn from atmosphere and passed through pre and hepa filters on the work surface. Tabletop covered with stainless steel sheet. Side panels are fixed and are made out of transparent acrylic sheet. The front door is folding type and made of thick acrylic sheet. Stand is built in type. Blower unit has AU or equivalent motor and is dynamically balanced with minimum sound & vibration level. Fluorescent lighting is also provided. A suitable UV tube is provided for sterilization. The chamber has been installed with One way gas tap for gas line. The manometer fixed outside the cabinet reflects the condition of the filters fitted inside and whether it is the right time to change the filters. Used mostly Activated Carbon filters. 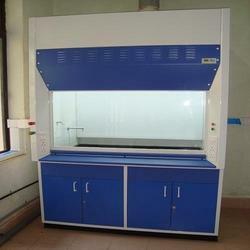 The fume hood is designed in order to throw out toxic or harmful Fumes. 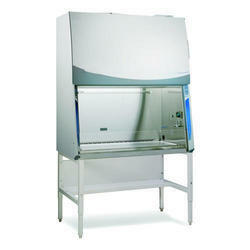 Fume hood are used to protect the persons and eliminate the toxic gases thro' ducting by exhaust blower. The high-grade transparent glass door offers excellent visibility of the chemical handling. The most suitable UV light provides you with optimum decontamination in the work zone surface. Highly effective backup safety device for the contaminant and exhaust of toxic, offensive or flammable materials. Centrifugal blower PP+FRP lined blower with FRP vinyl ester impeller. 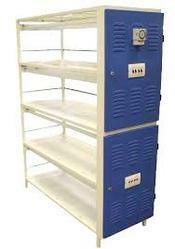 Brand Reliable Lab Equipment Co.
A bio safety cabinet (BSC) — also called a biological safety cabinet or microbiological safety cabinet — is an enclosed, ventilated laboratory workspace for safely working with materials contaminated with (or potentially contaminated with) pathogens requiring a defined biosafety level. Looking for Clean Air Cabinets ?